Being Good Isn't Zero Sum : 13.7: Cosmos And Culture Sometimes our values conflict. But sometimes they don't and the implications are liberating. Commentator Tania Lombrozo takes a look at the case for veganism. 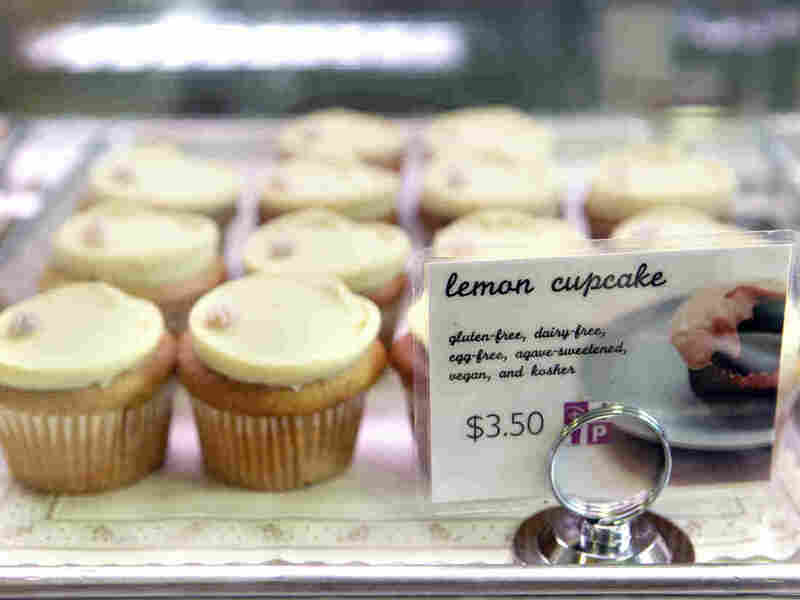 Choosing these lemon cupcakes because they're vegan doesn't mean you have to give up your other causes. "There are so many other human issues in this world for me to care about to also get all up in caring about factory animals." With so many pressing human needs, the logic goes, there's no room for compassionate action toward nonhuman animals. The underlying assumption is that being good is a zero-sum game, with gains for one cause — in this case, animal welfare — coming at the expense of another — in this case human welfare. Some of the time, being good truly is zero sum. If you're a philanthropist (with a finite amount of money), supporting one charitable cause reduces the resources you have available to support others. Or if you're an activist (with a finite amount of time), then working for one cause will reduce the time you have available to advance another. Even the rest of us face everyday decisions that pit one value against another. Should you buy the vegan chocolate bar that isn't made from fair trade cacao beans, or the nonvegan chocolate bar that is? These trade-offs are real, and I don't mean to diminish them. But for most people, the decision to become vegetarian or vegan — or to simply take a few steps in that direction, even if it doesn't involve a complete abdication of animal products — doesn't compete with advancing other goods. You can make your Oxfam donation and eat vegan cake, too. The zero-sum assumption may be compelling because it's buoyed by a few features of human psychology. First, there's evidence that people keep something like a moral balance sheet, with good acts of one kind licensing bad acts later on. Having given up on upgrading your smartphone to support a local charity, for example, you might feel you deserve that morally questionable cheeseburger. Second, there's some evidence that willpower is a limited resource, at least when people think that it's a limited resource. When you overcome temptation and make hard choices, it "uses up" some of your willpower, making it harder to resist temptation and make hard choices later on. So having resisted the temptation to upgrade your smartphone, you might fail to resist that cheeseburger. Third, there's plain old motivated reasoning: reasoning that's driven by the conclusion one is motivated to support, not (or not only) by the strength of the arguments and evidence. For many, giving up meat and other animal products is hard. We want to keep eating our cheeseburgers, so we come up with justifications to do so, and we convince ourselves they're sound. Finally, there may be another factor at work. For many, animal welfare ranks somewhere on their list of moral concerns, but not very highly. It may be uncomfortable to do something about No. 10 on your list if you haven't done anything about Nos. 1 through 9. Doing so could signal — to yourself and to others — that you don't care enough about those issues. (If you're giving up cheeseburgers, why aren't you also volunteering in your local community, campaigning to end poverty and donating your vacation fund to cancer research???) But really, isn't it better to advance something on your list, even if it isn't item No. 1? And especially if it doesn't trade off against it? When our values do trade off, we face serious quandaries. We don't always have the ethical equivalent of chocolate that's vegan, fair trade and uncompromisingly delicious. But being good isn't always zero sum — and the implications are liberating. Doing something is better than doing nothing, even when that something is a small and imperfect step toward a tertiary goal. You can keep up with more of what Tania Lombrozo is thinking on Twitter: @TaniaLombrozo.